Backyard storage tanks hold harvested rainwater for later use. A homeowner, gardener, or farmer might choose to collect and divert rainwater from the roof and store it in a tank to use later. Rainwater catchment systems can be as simple as diverting rain into a barrel, or as intricate as harvesting rainwater into high-volume cisterns to supply the whole household with usable water. Many people see this as a step toward “going green,” but for others who are facing drought conditions or lack of plumbing there is no other option available. Tanks are available in many shapes, sizes, and volumes to accommodate your needs. Green and black water tanks blend nicely with the surrounding landscape. Volumes range from 35 gallons (for the experimental home gardener) to 10,000 gallons (for industrial or larger agricultural needs). Those who choose to collect their rainwater are taking control of their water supply. Collecting free water falling onto your roof allows you to replace a substantial portion of your water needs and save money. With a bit of engineering, this water can be configured to supply the whole house or garden. The system can often be easily retrofitted to an existing structure or built during new home construction. Rainwater is relatively clean and completely free. Because it is free and stored on site, it allows homeowners and farmers total control over their water supply (which his ideal for regions where water restrictions are in effect). For those who are looking to reduce their environmental footprint, collecting and storing water represents a socially responsible and an environmentally conscientious lifestyle. Not only does collecting and storing water promote self-sufficiency and help conserve water, it also reduces storm water runoff (which otherwise collects pollutants on its way down roads and across parking lots toward storm drains). Furthermore, rainwater is superior to chlorinated water for landscape plants and gardens. The average American household goes through 320 gallons of water per day, 30 percent of which is for outdoor use. On top of that, 27 percent of the water used within the home is used for flushing toilets. Neither of these activities requires the use of chlorinated water. By using harvested, non-chlorinated (grey) water, energy that would otherwise be spent on water purification and transport is conserved. Stored rainwater has uses beyond landscape watering or toilet flushing. Collected rainwater can be used to wash your vehicles, pets, and driveway, refill your fountains, fish ponds, or swimming pools. If properly filtered and disinfected, stored rainwater can be used for all potable needs or industrial processes in lieu of municipally treated water. Lastly, in the wake of recent natural disasters, such as Hurricanes Katrina and Sandy or Superstorm Nemo, many Americans are also considering high capacity water storage as part of their emergency preparedness plan. Water storage and water purification are as essential as a food storage plan. However, these issues often receive scant attention compared with their importance. 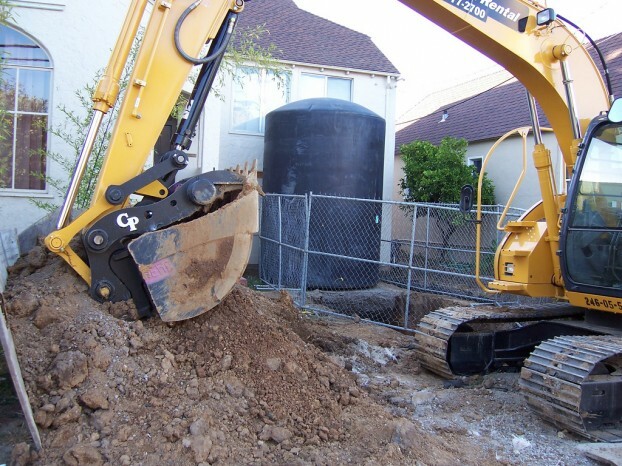 Access to potable water is often an enormous issue following a natural disaster and a backyard storage tank provides an excellent back-up water source for unexpected emergencies. Gerald Hammock focuses on home improvement, storage, renovation and other related topics. Those interested in storage tanks can learn more by visiting Go-To-Tanks. Image credit goes to Cheryl Bower. Previous story How Can Hot Tubs Help Those Who Suffer From Arthritis?